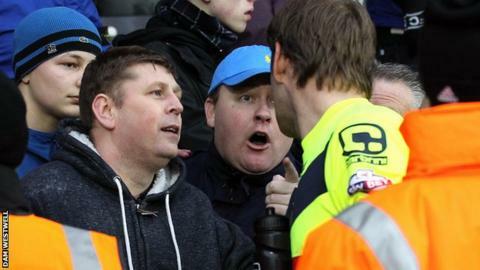 Notts County goalkeeper Roy Carroll was confronted by angry fans after Leyton Orient consigned the Magpies to a third straight defeat at Meadow Lane. Orient's Mathieu Baudry's had a second-half header cleared off the line before Shaun Brisley hooked the winner home after Notts County failed to clear the danger from a corner. Notts, who are yet to win at home under Jamie Fullerton, rarely threatened. Victory leaves Orient outside the play-off places on goal difference alone. Defeat sees Notts slip to 15th in the League Two table. "Obviously after the disappointment of last week I thought we came here and limited them to very few chances today. "I'm delighted with the response of the lads from last week and that's the main thing. "We're going to be looking at what we've done over the last few games at home, but hopefully next week you'll see me smiling like I am today." Match ends, Notts County 0, Leyton Orient 1. Second Half ends, Notts County 0, Leyton Orient 1. Attempt missed. Jon Stead (Notts County) header from the centre of the box is too high. Attempt missed. Izale McLeod (Notts County) header from the centre of the box misses to the left. Mathieu Baudry (Leyton Orient) wins a free kick on the left wing. Substitution, Leyton Orient. Jack Payne replaces Kevin Nolan. Attempt missed. Curtis Thompson (Notts County) right footed shot from outside the box is close, but misses to the left. Attempt missed. Jay Simpson (Leyton Orient) left footed shot from the left side of the box is close, but misses to the right. Substitution, Notts County. Adam Campbell replaces Liam Noble. Goal! Notts County 0, Leyton Orient 1. Shaun Brisley (Leyton Orient) left footed shot from the centre of the box to the bottom left corner. Corner, Leyton Orient. Conceded by Elliott Hewitt. Attempt missed. Haydn Hollis (Notts County) right footed shot from the centre of the box is too high following a corner. Corner, Notts County. Conceded by Nigel Atangana. Substitution, Leyton Orient. Calaum Jahraldo-Martin replaces Sammy Moore. Elliott Hewitt (Notts County) wins a free kick in the attacking half. Attempt blocked. Mathieu Baudry (Leyton Orient) header from very close range is blocked. Corner, Leyton Orient. Conceded by Curtis Thompson. Sammy Moore (Leyton Orient) wins a free kick in the attacking half. Substitution, Leyton Orient. Ollie Palmer replaces Armand Gnanduillet. Attempt missed. Armand Gnanduillet (Leyton Orient) right footed shot from outside the box is just a bit too high. Attempt saved. Jobi McAnuff (Leyton Orient) right footed shot from outside the box is saved in the top centre of the goal. Attempt missed. Sammy Moore (Leyton Orient) right footed shot from outside the box misses to the left. Corner, Notts County. Conceded by Alex Cisak. Attempt saved. Liam Noble (Notts County) right footed shot from outside the box is saved in the centre of the goal. Attempt missed. Alan Smith (Notts County) right footed shot from outside the box misses to the right. Armand Gnanduillet (Leyton Orient) wins a free kick in the attacking half. Second Half begins Notts County 0, Leyton Orient 0.